Established in Richmond, North Yorkshire in 1979, Swale Scaffolding has grown to become a market leader in the supply of scaffolding, safety and access products and services throughout North Yorkshire and Cleveland. 1991 saw the opening of a branch operation in Middlesborough and the setting up of a Hire and Sales Division, supplying towers, ladders and light access products as well as conventional and system scaffolding on both hire and sales basis. Swale Scaffolding, due to it's stature and knowledge of the market, is able to source its material at keen prices from leading suppliers and pass these benefits on to its customers through competitive rates. However good a company's products are, the quality of service extended to it's customers is down to it's people. 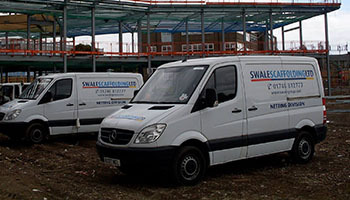 Swale Scaffolding has gathered together a group of Directors and Managers with a wealth of experience in the scaffolding and access industry. Through comprehensive induction and on-going training the highest possible standards of competence are met and maintained. This helps to ensure a stable management structure and a low workforce turnover all aimed at giving customers continuity of contract, particularly important in large progressive contracts and maintenance programmes and creating an 'easy to deal with' customer approach. This commitment to training is further extended to offer customers' operatives and staff, relevant instruction and certification (where required) to comply with ever growing legislation within the construction industry. Ensuring the customers requirements are precisely met, with the right materials, delivered where and when required, has been a key element in Swale Scaffoldings' success. The latest CAD design technology is employed to ensure accuracy in material availability, manning levels and delivery scheduling. This has contributed considerably to Swale Scaffoldings' reputation among main contractors' project teams as a highly efficient total scaffolding service operation.